I am happy to say that I am moving on from my day-walking TNCC re-certification nightmare. The fact that I passed, got to tell my daughter her mama got an ‘A’, and – you know – get to keep my job … well that part’s all gravy! I’ve got spoon rests in the works, along with more Santa ornaments and a few special memorial pendants to keep my studio kilns warm. And, because Christmas is one week away, DH has gutted our bedroom in preparation for painting, new flooring and crown molding. It’s such a perfect time for that! [NOT!] Oh well … so much for the Martha Stewart image this year! But, since it is that time of year, I recently made a ‘splurge’ purchase. 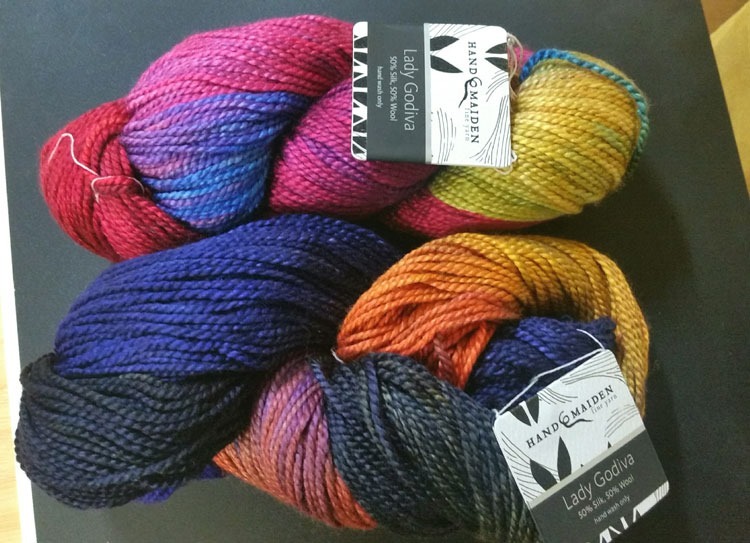 Look at this gorgeous yarn from Hand Maiden – and with a name like ‘Lady Godiva’ – it was meant to be mine! ← Trauma is serious business …. but wine is better!